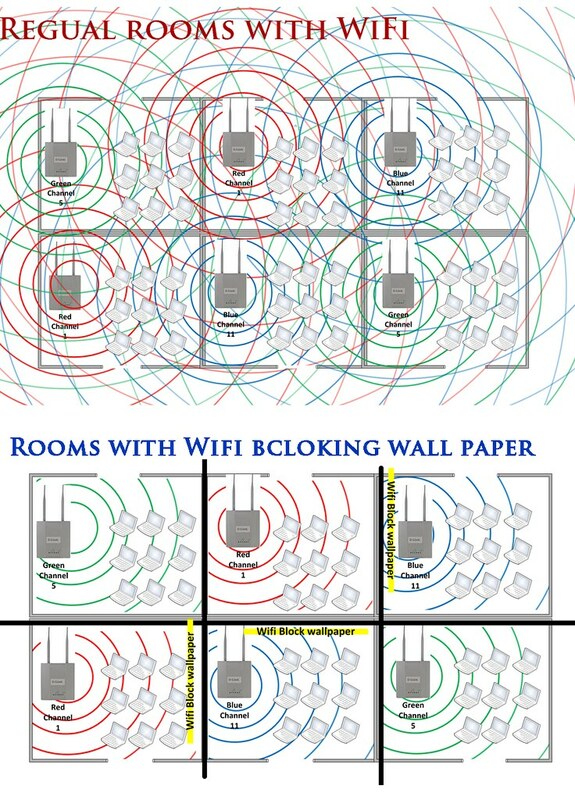 Today I got real excited seeing this WiFi blocking wall paper block in Gizmodo. I see these wall papers giving us capability of having scalable network in an enterprise environment. Most of the blogs I have come across is mainly about keeping home WiFi network single out of neighbor reach (security). This is a good thing, as it would allow end users to have more control over where his/her data travels, and stay out of the noise created by neighbor’s wireless network, better throughput and freedom of using all available channels. To deploy a 802.11 b/g wireless network in a home or office can be troublesome for various reasons. In an apartment like environment, you always have neighbors using up the all available channels (ironically you only have 3 non overlapping channels for 802.11b/g). When you finally manage to find a free channel someone will come and start using it and give you hard time with your performance. The demand for wireless network is growing; starting from your laptops, cell phones demands wireless channels extends to blue tooth, iPod, home theater, even up to your Xbox/ps3. This solution shall surely allow you to have more access point installation in a smaller area without having too much to worry about power and channel. Please feel free to make comments on the proposed solution, as I plan to try it out not in a very distant future. Next Post What is ECM? Document workflow work in an ECM? dats cool :D…but whaths the technoogy with these wallpapers,how can they block them? ya interesting topic, but still you dint answer me,how these wallpapers work? It is covered with geometrical tracings with conductive ink (ink containing silver particles). The silver crystals are arranged in such a way that they are able to block certain wireless frequencies, not least of which is the same frequency as a WiFI router. @binoyskumar Did you read any of the links that Saad had posted as his sources ? It might help. Lol sorry bout that autocorrection decided to decide for me..